Happy 4th of July! I hope you all have a wonderful holiday celebrating with your family and friends. Whether you're firing up the grill or hanging out by the pool, chances are you want to bring along the tunes. The folks at Slacker Personal Radio have programmed the perfect station for your Independence Day enjoyment. Click the image below to check it out for yourself! 4th of July Celebration on Slacker Radio: Celebrate the U.S.A. on the 4th of July with patriotic music and summer fun songs. Festive Independence Day hits, party oldies and stirring marches. 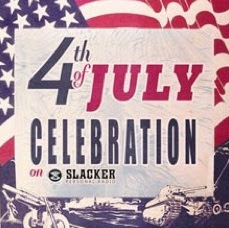 4th of July Celebration on Slacker Radio is your soundtrack to the holiday weekend. Available on a great range of devices including mobile phones, the iPad, Sonos, Roku, Ford cars and more, it's easy to take Slacker Personal Radio along with you for your holiday activities! Check back later in the week, I'll have a great giveaway opp from the folks at Slacker! Wishing you all a wonderful and safe 4th! Ramblings of a Texas Housewife Product Review and/or Giveaway Disclosure- I have received no compensation from Slacker Personal Radio other than the offer of free product to review and/or giveaway. Any opinions expressed on Ramblings of a Texas Housewife are my own. My reviews are never reviewed or edited in any way by sponsors.